On April 26, 1607 English settlers set foot on dry land for the first time in five months on what is now Cape Henry, Virginia. They would continue to explore around the Chesapeake Bay and then up the James river, eventually choosing Jamestown Island as the site for their settlement on May 14, 1607. What did they face and what were the conditions like for these first settlers? America in 1607 from National Geographic helps to explain that. 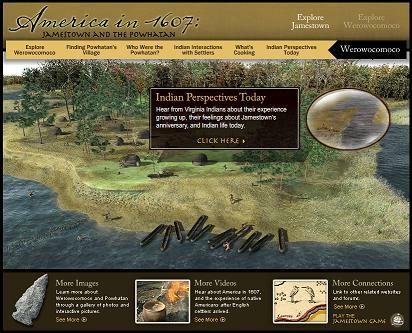 America in 1607 is a fantastic interactive lesson and exploration of not only the original Jamestown Fort and subsequent residential colony, but also of the surrounding area called Werowocomoco and the native Powhatan people. Students can explore both areas in depth with America in 1607 learning about the daily life in the fort and in Werowocomoco as both developed and adapted to new neighbors. They can continue learning about the subsequent archaeology to discover the sites and modern perspectives on Indian relations and the impact of the Jamestown Colony. America in 1607 provides many excellent images and videos that explain the histories of Jamestown Fort and Werowocomoco thoroughly. In addition, there are external links for more sites and potential webquest stops for you to build off of. On the Trail of John Smith – An interactive adventure game from NatGeo Kids for younger students. Short cartoon videos tell the story of John Smith and each is accompanied by a mini-game to play such as a puzzle to build the fort, a matching game with Pocohantas, and a boat race. Historic Jamestowne – This is the official website of the modern archaeological site. Learn about events at the site as well as updates on the ongoing excavations of the fort and settlement areas.